SAN FRANCISCO – Evan Longoria expects to win immediately with the San Francisco Giants, whose run of success in even years is well documented – and the club’s new third baseman knows all about that. The Giants’ brass realizes adding Longoria to the lineup and an already-talented infield gives San Francisco a far better chance of bouncing back from a surprising last-place season in the NL West. An offense-producing third baseman the Giants sought this winter, Longoria was traded from Tampa Bay on Wednesday for outfielder Denard Span, star infield prospect Christian Arroyo and two minor league pitchers. The position had been a priority for San Francisco, and Longoria’s durability means so much, too. He has played at least 156 games in each of the past five years, all 162 in 2014, and also hit 20 or more homers in each of those five seasons. “He’s sorely needed and will be a great addition for us,” Giants general manager Bobby Evans said. It marked the first big offseason move by each organization. 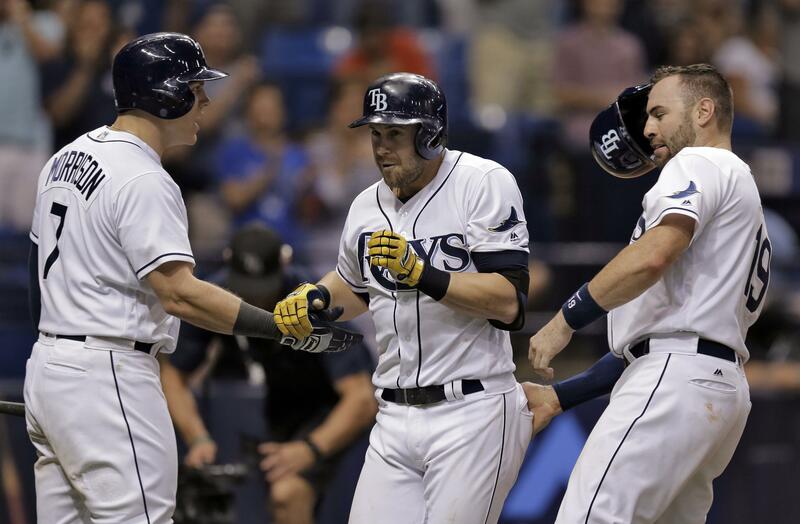 Tampa Bay in effect is responsible for $14.5 million of the $88 million Longoria is owed, and the Rays took on $13 million in guaranteed money due Span. Longoria had $86 million in remaining guaranteed salary and buyout as part of a contract that runs through 2022 and contains a 2023 club option. The $9.5 million in deferred money included in that total was converted to an assignment bonus payable by the Rays from 2025-29. Tampa Bay will give the Giants $2 million by this Dec. 31 to cover Longoria’s assignment bonus and an additional $3 million by Oct. 31, 2022. The 32-year-old leaves Tampa Bay as the longest-tenured player in franchise history, after spending 10 of his big league seasons in a Rays uniform. He is the club’s leader with 1,435 games, 261 home runs and 892 RBIs. Longoria started all 30 of the Rays’ postseason games at third. Longoria batted .261 with 20 homers and 86 RBIs last season. The 2008 AL Rookie of the Year and three-time Gold Glover has played at least 156 games in each of the past five seasons and hit 20 or more home runs in all of those years. In November 2012, Longoria received a $136.6 million, 10-year contract with Tampa Bay that added six guaranteed seasons and $100 million to his previous deal. If exercised, the option would make the agreement worth $144.6 million over 11 years. He will complete his 10th season of major league service on the second day of next season, which would have given him the right to approve any trade from the Rays as a 10-year veteran who spent five or more years with his current team. Still, he was the face of a small-market franchise and meant so much to the city. “The decision itself was one that was incredibly difficult for us to make,” Neander said. The 33-year-old Span has hit .283 with 60 homers and 432 RBIs over 10 years in the majors, but San Francisco was looking for more athleticism and steady defense in the outfield. In fact, manager Bruce Bochy had approached Span about the possibility of playing left field going forward. Span led the Giants last season with 73 runs scored despite a stint on the 10-day disabled list. He previously played for the Nationals and the Twins. Bochy expects Longoria to bat third or cleanup, and he can already envision Longoria as part of a top infield with Gold Glove shortstop Brandon Crawford, second baseman Joe Panik and Brandon Belt at first. Arroyo, a first-round draft pick out of high school in 2013 about an hour north of Tampa in Brooksville, was one of the Giants’ top prospects but didn’t play in the majors after June 2 because of a broken left hand. He batted .192 with three homers and 14 RBIs in 34 games. The Rays have been watching him for years and believe he is making significant strides at the plate. “That’s the cost of doing business,” Sabean said of sending Arroyo in the deal. The Giants also sent right-hander Stephen Woods and left-hander Matt Krook to the Rays, who acquired third baseman Matt Duffy from the Giants at the 2016 trade deadline for Matt Moore. The left-handed Moore was dealt last week to Texas. As part of the assignment bonus, Tampa Bay owes Longoria $1.5 million on Dec. 15, 2025, and $2 million on Dec. 15 in each of the following four years. San Francisco will pay Longoria salaries of $12 million next year, $12.5 million in 2019, $13 million in 2020, $16.5 million in 2021 and $17.5 million in 2022. Span gets $9 million plus possible performance bonuses next year, and the Rays inherit a $12 million mutual option for 2019 with a $4 million buyout. Longoria counts as $11,165,300 annually for the Giants’ luxury tax payroll and Span $13,333,333 for the Rays’ tax payroll. In addition, the Giants receive a $600,000 yearly credit for the cash transaction in the swap. San Francisco, which won World Series titles in 2010, `12 and `14, made its first big offseason move after missing out on Giancarlo Stanton and Japanese star Shohei Ohtani. The Giants went 64-98 to avoid the club’s first 100-loss season since 1985. Published: Dec. 20, 2017, 9:46 a.m. Updated: Dec. 20, 2017, 7:08 p.m.